Small businesses or community organizations, like restaurants or well-meaning citizens running a charitable fund-raising event, often don’t have many formalities around their operation, so when there is a dispute over the ownership of the name it’s bound to be very messy. But I don’t think there is any more vexing trademark ownership situation than that of a musical band’s name. Bands are different from other types of loosely-organized relationships because bands have another layer of identity, those of the individual members. The New York Philharmonic was still the “New York Philharmonic” after Leonard Bernstein died, but can there be a “Rolling Stones” when Mick Jagger is gone? What exactly is the goodwill associated with the band’s trademark when individuals are also strongly identified with the band? That’s the conceptual problem, then add in the mix pro se litigants who don’t have any understanding of the substantive law, how to make legal arguments, what kind of evidence is relevant, or how to get that evidence admitted, and you have the trademark opposition Rosa v. Vargas. The mark in dispute was FULANITO for live musical performances and other Class 41 services. For evidence, there were three short depositions (one inadmissible), all taken the same evening, some flyers and computer screenshots used as exhibits during the depositions, and a lawyer’s letter. 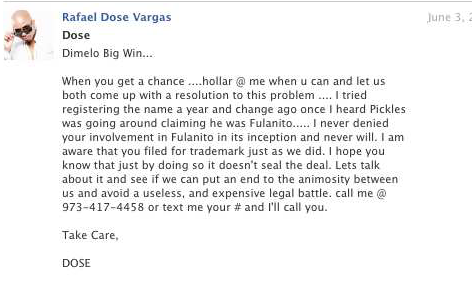 The disputed application was filed by Rafael Robert Vargas, a former brother-in-law of the Opposer, Winston Rosa. The original band started in 1997 and consisted of Opposer Rosa, Applicant Vargas, Rosa’s father (who was a renowned performer in his own right), and a varying roster of other family members and close friends over time. In 2004 Vargas left the band and started performing as FULANITO as a solo act (autoplay AND undulating scantily clad women alert! ), while the Rosa family also continued to perform as FULANITO (autoplay only alert), both using this same logo. If Mr. Vargas obtains the rights to the mark by himself, surely he will cause confusion since the most popular songs performed by the band have been known by the public to be produced majorly by our equal partnership Windose International. (a) which party invented and first affixed the mark onto the product/service; (b) which party’s name appeared with the trademark on packaging and promotional materials; (c) which party maintained the quality and uniformity of the product, including technical changes; (d) which party does the consuming public believe stands behind the product, e.g., to whom customers direct complaints; (e) which party paid for advertising; and (f) what a party represents to others about the source or origin of the product. The highlighted album was one made by Vargas alone after he left the group. As to the legal legal entity Windose, there was no evidence that it had any formal claim on the group’s name and mark, but there was evidence that Rosa and Vargas, as individuals, shared equally in the costs of the Fulanito musical group and were responsible for the quality and uniformity of the group’s performances and recordings. neither Opposer nor Applicant had exclusive rights in the Fulanito mark in connection with any goods or services before this family musical group was dubbed “Fulanito.” Given the pivotal role that Opposer’s birth family played in the formation and history of this musical group, the absence from Applicant’s performances and albums of all the members of the De La Rosa family would suggest a very different musical experience. 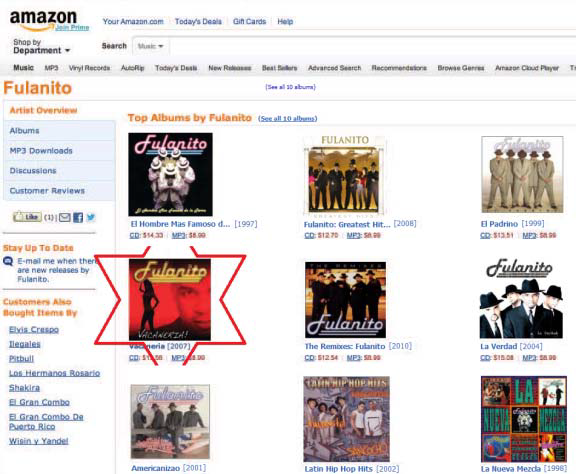 Finally, we agree with Opposer that after years of multiple De La Rosa family members appearing together on album covers and in public concerts, always wearing matching suits and fedoras, it seems likely that most consumers of Fulanito’s public performances and musical recordings would anticipate that Fulanito would be a small group of men, but never a solo act. Applicant was not the sole owner of this mark as of the filing date of the involved use-based application. At best for Applicant, he was a co-owner of the mark with Opposer, and possibly others, who have not provided their consent to Applicant’s registration of the mark. Hence, the involved application is void ab initio. Rosa v. Vargas, Opp. No. 91205076 (TTAB June 27, 2014).